Monticello Woods is a planned residential home community in the heart of Williamsburg. Centrally located just off the Monticello corridor, Monticello Woods is convenient to everything, and in one of the most desirable locations in James City County. There are currently a number of new homes under construction by Harbin Builders, and several model homes to view. The neighborhood is just minutes to shopping, as well as the Mid County park complex (home to Kidsburg, walking trails and lighted athletic fields), the Williamsburg National Golf Course, and the Virginia Capitol Bike Trail. The community, which borders historic Powhatan Creek, also features 50 acres of community property, including its own clubhouse and pool, hiking trails, and several ponds. Information about the HOA can be found at www.monticellowoods.org. 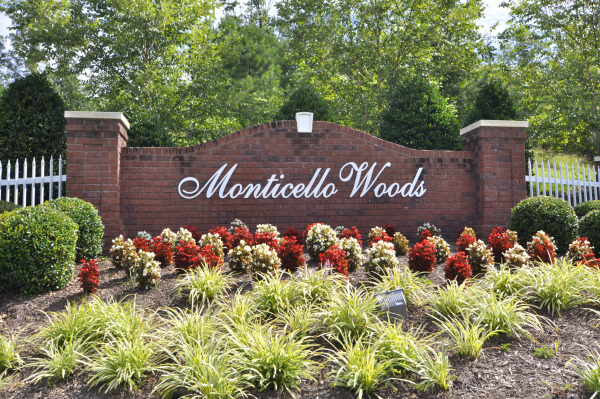 When the community is complete, Monticello Woods will feature 149 residences. Homes already built in the neighborhood average 3,000 square feet, but range from 3 bedroom ranches to 5 bedroom colonials, and everything in between. A drive through the neighborhood shows off true Southern character, and a reflection of why Monticello Woods is one of Williamsburg’s premier communities. Check out Monticello Woods on Facebook at http://www.facebook.com/MonticelloWoods. Want to Get the Scoop on Monticello Woods homes for sale? Simply click below to fill out the form, designating Monticello Woods as your selected neighborhood, and you’ll receive automatic e-mail alerts when any new listings come on the market in Monticello Woods, or when any closings take place, so that you can monitor home values in Monticello Woods.